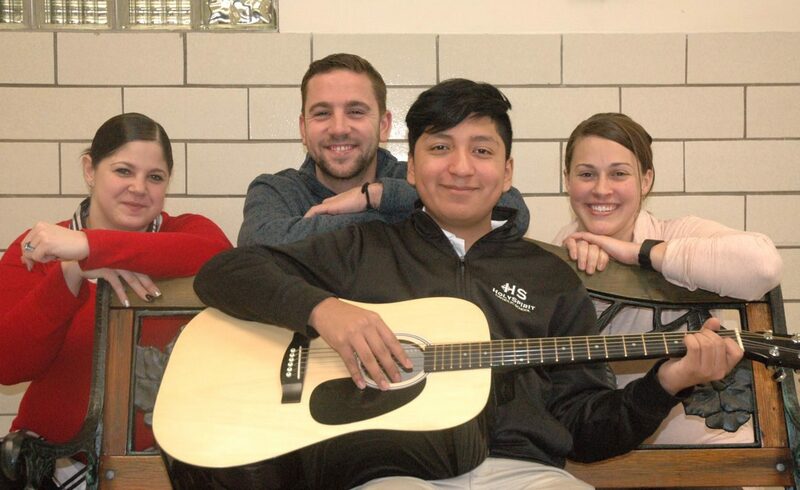 Ethan Velazquez, a 12-year-old at Holy Spirit School in Indianapolis, plays his guitar alongside school staff members Stacy Inman-Davidson, Lucas Stippler and Lauren McLaughlin. The three staffers are credited with their quick actions to help save the life of Ethan, who had a heart attack on the school playground in May 2016. (CNS photo/John Shaughnessy, The Criterion) . INDIANAPOLIS (CNS) — The fear flashes in their eyes again as the educators recall rushing to the child who was lifeless on the ground. Shaughnessy is the assistant editor of The Criterion, newspaper of the Archdiocese of Indianapolis.